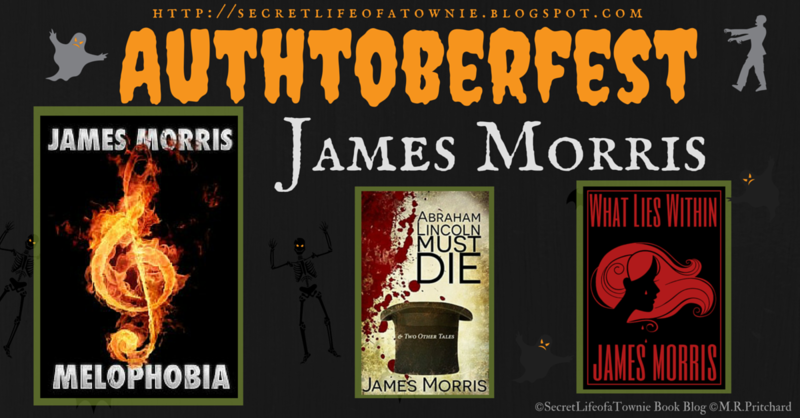 Secret life of a townie: Today's Authtoberfest featured author is JAMES MORRIS! Today's Authtoberfest featured author is JAMES MORRIS! James Morris is a cool guy. He has won two KindleScout campaigns this year! What an accomplishment. James has written some great reads, people. Check out his links below. Let's see what James had to say about All Hallows' Eve! 1. It’s Halloween, pick 3 of your favorite writer buddies to paint the town read with and tell us why you chose them. James says: I’m really not sure. Unlike the zombie apocalypse where survival is at stake, going to a party is a lot more personal. I’d want to know the writers as people first, which is a problem because really, I don’t want to know most writers. Not that they’re not nice people. But if I love a piece of work, and then I meet the writer, and he or she turns out to be an odious turd, then it’s forever going to impact how I read the book. And the book and the person, to me, are separate things. All that to say, I’d dress up in a costume, like maybe Darth Maul where no one would recognize me and let my id roam free. 2. You’re ready to head out with your pillowcase to collect loads of confections on All Hallows’ Eve, what’s your costume and why did you choose it? James says: I used to love Halloween, but as people got older, there were fewer and fewer parties. I’m talking Halloween bashes where everyone is costumed (and not “as themselves” – seriously, why go to a Halloween party without a costume!) Having said that, my wife and I talked about going as Wonderwoman and Superman. But you know what? I can’t pull off that costume. I think I’d prefer to go as Hugh Hefner. 3. Old Mrs. Robinson opens her door and you’re holding open your pillowcase patiently waiting. “Oh deary,” she says in her frail, little old-lady voice. “I forgot it was Halloween. Don’t know why you kids go begging anyways. Let me go find something to give you.” She shuffles off and finally returns three and a half minutes later with 5 pennies, 2 peppermint candies that look like they went through the dryer, and her deceased husbands dentures. “Take what you like,” she offers, squinting at you. What do you choose and why. James says: Hilarious. (I will share, one year while trick-or-treating, a woman gave us peanuts. Like, 3 of them. With the shells on. I thought it was the worst treat ever.) As for Mrs. Robinson, I’d skip the 5 pennies, as well as the peppermint candies and take the dentures. Who knows when I might need them? Bwhahaha. 4. I really love reading Dean Koontz but some of his stuff scares the bejesus out of me. What’s the spookiest book you’ve ever read? James says: The one most recent was Birdbox by Josh Malerman. I thought that was one of the most unique horror books ever, and I’m kinda jealous I didn’t think of it. The other one that stands out in memory is Stephen King’s “The Shining.” How he made the shrubbery maze – with its topiary animals – scary, was very cool because that idea could’ve gone very, very wrong. Meredith says: Birdbox was an awesome read. 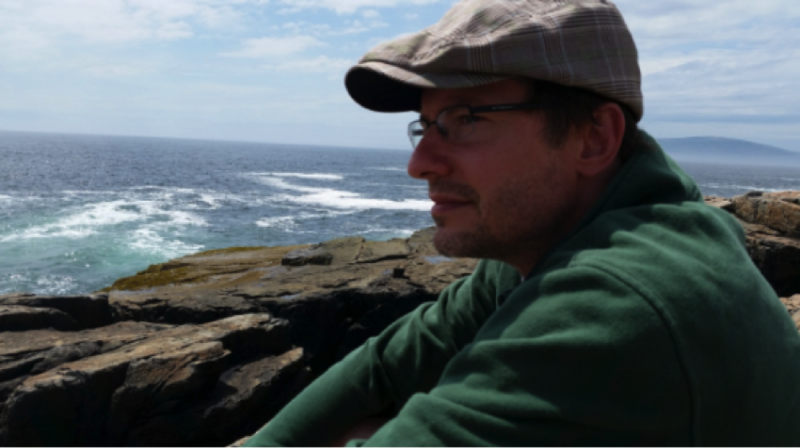 Josh Malerman's interview is on 10/31, stay tuned! 5. You’re a writer by day and supernatural creature by night. (Shed that human skin you sack of bones) What are you and why? James says: One of my cool elementary school teachers played us Danse Macabre by Saint-Saens during Halloween. And I always liked that story of the skeletons dancing with abandon during that one special night a year, and then returning to their graves during the day. I’m not sure what creature I would be – vampire, werewolf, ghost – they are all so interesting – but I love the idea of capturing the spirit of life, which we unfortunately only really appreciate in the face of, or in the wake of, a tragedy and death. 6. Every author has a bookshelf filled with his or her favorite reads. Run on over to yours and tell us the scariest book you have. 7. We don’t all write horror but there comes a time when you’ve got to surprise your readers and make sure their hearts are still beating. How do you prepare yourself to get in the spooky writing mood? James says: Scary or sweet, it’s the same. It’s boring, I know, but I just sit. And then I think: what would surprise me? What would scare me? Of course, making sure that I don’t have happy music in the background helps! 8. Stephen King’s front porch light is on but there are no Halloween decorations. James says: I’d definitely trick-or-treat. His house during Halloween must be insane. 9. Congratulations, you just won the literary lottery and sold a million books at full price! The royalty check clears on October 28th. What are you buying for the neighborhood kids? James says: None of the above. I’m buying them peanuts with the shells on, so that they can remember me years and years later as the guy who gave them the worst treat ever. Meredith says: I just laughed out loud! 10. Your writer friend calls you with some frightening news. They’re giving up on writing, can’t take the pressure any longer. What do you tell them? James says: Writing is very personal; it’s like religion or politics that way. I would say I understand why they’re stopping. I’ve said before that writing as a career is not pragmatic at all and filled with heartache. Why we continue to do it speaks to the crazy love we have for it. So, when that love starts to wane, I’d say, take a break. For now. And then see if the passion returns. It’s not a failure. You are not a failure.